Or maybe that heading should read THE first series. Yes, for this particular reviewer, Homicide: Life on the Street was, and probably always will be, THE American TV cop show. But I'm getting ahead of myself. "Along with Homicide: Life On The Street, Star Trek is the best one hour drama on television today." Now at this point in time TNG was hitting television high notes with impressive consistency, the best episodes featuring some of the most accomplished writing and direction on American or British television. Cinefantastique, meanwhile, was a crucial critical voice of the genre – when they spoke, fans took notice, and when they started talking about a series, a non-science fiction series at that, being as good as TNG, only a fool would not be at the very least curious. It took a while for Homicide to appear on UK TV and it did so without fanfare or much in the way of press coverage. Another American cop show lands on British television, and on a then minority channel at that. Now I'll freely admit that my first encounter with the show left me fascinated but not quite as hooked as I would soon become. The very things that in retrospect make the first episode so extraordinary seemed like small barriers to engagement on that initial viewing, a shift of approach to a generic formula that required a considerable adjustment on the part of the viewer. If this happens to you then my advice is to stick with it, and if by some chance you haven't made that adjustment by the end of the first episode, then I can almost guarantee you will have by the third, as by then you will better know the characters and will have tuned in to the show's distinctive approach and style. But approach that first episode with your expectations wide open and you'll very quickly appreciate just how innovative and compelling and beautifully written and constructed Homicide: Life on the Street is. It's important to acknowledge that this is still a police prodedural drama operating within rather than outside of the genre and that many of its composite elements are TV drama and cop show standards. The detectives in the Baltimore Homicide Unit, for example, are an unsurprisingly diverse bunch, with team loyalties and friendships regularly tested by personal and professional conflict. They even have an authoritative black captain, an almost staple requirement of cop shows and films in the 80s and 90s. So what, exactly, is so different about this series? Oh, where to begin...? The primary task for the opening episodes of any new series is to introduce us to the characters with whom we will be spending the subsequent weeks. A favourite method of doing this is through the arrival in the group of a newcomer to represent the audience viewpoint, as their introduction to the location, the characters and the rules of this particular game coincide with our own. Our sympathies are expected to lie with them, and their take on this new world is one we will ideally share. As they meet, learn from and engage with their new colleagues, then so should we. The opening episode of Homicide, titled Gone for Goode, certainly follows this formula, but disrupts it in significant ways. With that in mind, the most striking aspect of this first episode is that it doesn't play like a first episode at all. Compare, for example, Gone for Goode with Encounter at Far Point, the pilot episode of Star Trek: the Next Generation, and the differences become clear. For all its many merits, Encounter at Far Point is unmistakably a pilot episode. The actors are still finding their way into their characters and Captain Picard's wonder at his new command is used to introduce us to the starship and its crew. We learn that Troi is a half-Betazoid telepath, that she and Commander Riker once had a thing going, that Riker is a self-assured and skilled pilot, that Picard doesn't like kids and has a history with the ship's doctor, Beverly Crusher, that Data is an android armed with a childlike curiosity and considerable strength, and so on. None of this is absorbed organically – in almost every case the narrative is effectively put on pause to introduce each of these characters and their defining traits. Stand Encounter at Far Point beside any later TNG episode, where knowledge of all this is assumed, and the differences in structure stand out a mile. But compare Gone for Goode with any other episode in series 1 of Homicide and you'll be pushed to spot any significant difference. The episode opens, as do a fair few others, at a crime scene in the middle of a conversation between two of the detectives, and if you're coming to the series fresh it will be a couple of minutes before you realise that they are homicide detectives. We're past the main title before new team member Tim Bayliss (Kyle Secor) arrives on the scene. But against expectations he is formally introduced to almost no-one and, like us, catches the other detectives only in passing as they all but ignore him and go about their business. All of them are already involved in cases, the details of which emerge during the course of the episode, and we work out who is who by eavesdropping on their conversations. Like Bayliss, we walk into a squad room whose inhabitants have known each other for some time and whose loyalties and conflicts are already well established. Like him we are outsiders in their company and will have to learn about them as we go. But there's more. Despite being set up here as the audience identification figure, Bayliss turns out not to be our man. At least not yet. His uncertainty and perhaps naive enthusiasm and the fact that he pulled some strings at his previous post with the Mayor's security detail to get this job prompt us to see him not through sympathetic eyes but those of the unit regulars, as a newbie who is unlikely to cut it in this department. This puts us in the unusual position of being outsiders in a unit that we quickly engage with, or perhaps I should say want to engage with. Like Bayliss, we desire to be accepted into this group, but somehow believe we'd be more savvy and less awkward than him in doing so. This break from the norm is further emphasised when, instead of following Bayliss on his first day on the job, he is paired off with one of the detectives and temporarily drops out of the narrative. We are left instead to ride with the various partnered pairs as they go about their individual investigations, intermittently catching up with Bayliss almost in passing. It's here that we get to know the characters, as we hang out with them and listen to them riff on everything from relationships to old cases, from food to conspiracy theories. The investigations themselves form only a small part of this banter – like Pulp Fiction the emphasis is on what the characters talk about between the business of their jobs, and as with Tarantino's film, it's offbeat and engaging stuff. 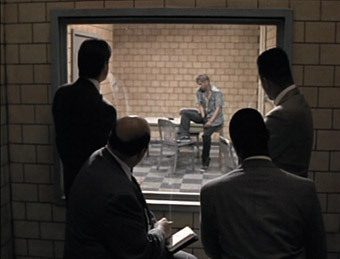 That we connect with all of the detectives as screen characters so quickly is down to a blend of creative writing, interesting and believable characters and a cast who have clearly nailed their parts before a single frame of film was shot. In a complete reverse of the expected norm, the character we've bonded with the least by the end of the episode is newcomer Tim Bayliss. 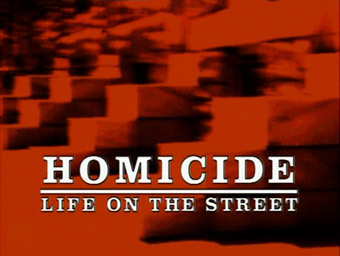 First developed by writer Paul Attanasio and steered to the screen by executive producers Barry Levinson and Tom Fontana, the series was inspired by and directly based on the superb novel Homicide: A Year on the Killing Streets by David Simon, a Baltimore Sun reporter who spent a year with the city's homicide unit, whose cases and characters during that period he chronicled in compelling detail. Many of the real-life detectives and cases from Simon's book are instantly recognisable on screen (Simon was creative consultant to the series), and it is this reality base that gives the series its strong sense of what it's actually like to be a city homicide detective. As a result we have a clear feel for each of the characters by the end of the first episode and by the close of episode 3 they are becoming like old friends. It's no wonder that series fans became so involved in their fate. Lieutenant Al Giardello, played by the marvellous Yaphet Kotto (whose many big screen roles have included the Caribbean bad guy Mr. Big in Live and Let Die and the obstinate engineer Parker in Alien), is a typical black police captain in first appearances only. Given to referring to his Sicilian ancestry, he can be at his most persuasive when smiling widely and offering deceptively friendly advice, usually delivered as if he has something incriminating on the detective he is addressing, and when he does lose his rag you'd better be ready to run. Clark Johnson plays Meldrick Lewis, a pragmatic city boy who is initially caught indulging in a little casual racism towards his long-standing partner, Italian-American Steve Crosetti* (played by John Polito, a veteran of over 150 film and TV roles and particularly memorable for his roles in the Coen Brothers' Miller's Crossing, Barton Fink and The Big Lebowski), whose unrelenting obsession with who really shot Abraham Lincoln is driving Lewis to distraction. The squad's only female detective, Kay Howard (Melissa Leo), dresses like the guys for practicality and blends a dogged enthusiasm with weary cynicism ("Homicide?" she responds to Bayliss's enquiry, "We work for God"), which may be at least partly due to her long-term partner Beau Felton, a cop whose instincts are sometimes better than his enthusiasm and who, as played by Daniel Baldwin, has the genuine look of a put-upon scruff rather than the carefully sculpted designer nerdiness you'll find in shows such as 24. Detective John Munch, delightfully played by ex-stand up comic and conspiracy theorist Richard Belzer, is unquestionably one of the squad's most intriguing characters. A world-weary cynic given to extensive philosophising and theoretical musings, he tends to look back at the 1960s as a better time, has continual relationship problems and has a liberal attitude to the whole issue of drugs. He is partnered with tetchy, middle-aged divorcee Stan Bolander (played by veteran actor Ned Beatty), who appears to tolerate rather than actually respect Munch, whom he often unfavourably compares to his old partner Mitch. "Then what you will be privileged to witness will not be an interrogation, but an act of salesmanship, as silver tongued and thieving as ever moved used cars, Florida swampland or bibles. But what I am selling is a long prison term, to a client that has no genuine use for the product." 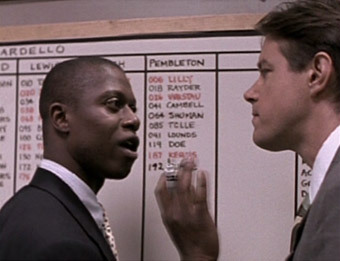 Sublime, but so, so right for the character of Frank Pembleton, a man for whom language is as much part of his professional identity as his gun or badge. That said, Braugher is no scene stealer – he works in perfect partnership with the other actors and is an integral part of one of the best ensemble casts the small screen has ever seen. There's no doubt that the series owes a huge dept to Stephen Bochco's pioneering Hill Street Blues, whose multi-character approach and rough-edged camerawork transformed the look and feel of the TV police drama forever. Levinson and Fontana build on Bocho's approach and further enhance the show's documentary feel through the then unusual decision to shoot on high speed Super-16mm stock (35mm was the still format of choice for prestige productions in the US) and entirely hand-held, another American TV drama first. Their masterstroke here was not to just try and emulate the documentary look, but to hire documentary director and cameraman Wayne Ewing (Free Lisl, Benched: The Corporate Takeover of the Judiciary, The Last Campaign) as director of photography. Ewing's contribution is crucial to Homicide's still-unique look and feel – the post-NYPD Blue twitchy camera technique that has become an almost obligatory component of film and television dramas has no place here, where the camerawork is as tight and fluid as it would be on a straight documentary, adding an urgency and immediacy to dramatic scenes in a way that involves the audience as participants in the drama rather than as cinematically distanced observers (car conversations, for example, are shot from the back seat rather than with the standard bolt-on camera mounts, placing us in the position of passengers in the police vehicle). The editing is similarly edgy, with the use of jump cuts, repeated shots and a total disregard for the 180 degree rule breaking many of the established technical standards of television drama, but used to far better effect than the MTV-inspired, look-at-me cutting of so much recent televisual eye candy. One of the reasons TV's best ever cop show remained so compelling, despite the almost complete absence of many of the expected genre trappings (car chases and shoot-outs are rare and we arrive at most murders only after the event), is that the show gets under the skin of its characters, to the degree that even straightforward seeming cases become as important to us as they do to the detectives. But in the end there is no one thing that defines why Homicide: Life on the Street is such bloody marvellous television, but an almost divine combination of perfectly realised elements. In the finest episodes – and you'll see a few of them in the first series – Homicide is TV drama at its absolute best. The influence of the series on future police procedurals is incalculable, its shadow visible on any number of other films and TV series that followed in its wake. An impressive array of respected filmmakers came in just to direct two or three episodes, including actor-director Keith Gordon (The Chocolate War), Barbara Kopple (Harlan County, U.S.A.), Peter Medak (The Ruling Class), Uli Edel (Last Exit to Brooklyn), John McNaughton (Henry, Portrait of a Serial Killer), Tim Hunter (River's Edge), Katherine Bigelow (Near Dark, Strange Days, Point Break), Whit Stillman (Metropolitan) and Martin Campbell (Edge of Darkness), and Dogme 95 maestro Lars von Trier has quoted it as a major influence on the style of Dancer in the Dark. Nothing, and I do mean nothing, has come close to matching it, and it remains, for me, quite simply the finest police procedural series American television has ever produced. And yet it so nearly ended after just one season. With viewing figures lower than expected, the network were all set to cancel the future episodes when the unexpected happened and it bagged two major Emmy Awards and was suddenly elevated to the status of flagship show. There is little doubt this that hiccup accounts for the oddity a second series consisting of just four episodes. The A&E US DVD release retained the original series numbering, but Fremantle's UK release combines series 1 and 2 into one. If future series are also to be released in the UK, fans should be aware that the series numbering will be out by one. the episode guide that follows uses the original production codes and A&E's episode and series numbering for its order. * Each of Lewis's jibes is met with the response "You'll regret that," an almost throwaway remark from Crosetti that comes back to haunt Lewis at the episode's end.